There’s no doubt that Americans are in love with red meat. Ever since the early times of the United States, red meat has been one of the top five foods consumed by Americans. But the love affair between Americans and red meat has hit a roadblock in recent years. Several studies have pointed out that a diet high in red meat may shorten your lifespan. Research has tied consumption of red meat to increased risks of diabetes, cardiovascular disease and certain cancers. It’s hard to change old eating habits, but heck, isn’t living to a ripe old age the goal of most Americans? Well, that’s how I feel about it. And it is one of the reasons why Therese and I try to keep our number of meals that contain red meat to one a week. One way we do this is by eating poultry. Free-range chickens and wild pheasant usually find their way to our dining room table at least once a week, and there are days when we go totally meatless. Another way we’re cutting back on red meat is to try having seafood, shellfish or fresh fish at least once a week. A recent study published in the journal of the American Medical Association found that eating one serving per week of fish —which is rich in omega-3 and DHA fatty acids — can lower the risk of cognitive decline and prevent diseases such as Alzheimer’s. And according to the U.S. Department of Agriculture’s 2010 Dietary Guidelines for Americans, eating about 8 ounces per week (less for young children) of a variety of seafood can help prevent heart disease. Eat a variety of seafood: Include some that are higher in omega-3s and lower in mercury, such as salmon, trout, oysters, Atlantic and Pacific mackerel, herring, and sardines. Keep it lean and flavorful: Try grilling, broiling, roasting, or baking — they don’t add extra fat. Avoid breading or frying seafood and creamy sauces, which add calories and fat. Using spices or herbs, such as dill, chili powder, paprika, or cumin, and lemon or lime juice, can add flavor without adding salt. Shellfish counts too: Oysters, mussels, clams, and calamari (squid) all supply healthy omega-3s. Try mussels marinara, oyster stew, steamed clams, or pasta with calamari. Keep seafood on hand: Canned seafood, such as canned salmon, tuna or sardines, is quick and easy to use. Canned white tuna is higher in omega-3s, but canned “light” tuna is lower in mercury. Cook it safely: Check oysters, mussels, and clams before cooking. If shells don’t clamp shut when you tap them, throw them away. After cooking, also toss any that didn’t open. This means that they may not be safe to eat. Cook shrimp, lobster and scallops until they are opaque (milky white). Cook fish to 145 degrees, until it flakes with a fork. Get creative with seafood: Think beyond the fish fillet. Try salmon patties, a shrimp stir-fry, grilled fish tacos, or clams with whole-wheat pasta. Add variety by trying a new fish such as grilled Atlantic or Pacific mackerel, herring on a salad, or oven-baked pollock. Put it on a salad or in a sandwich: Top a salad with grilled scallops, shrimp or crab in place of steak or chicken. Use canned tuna or salmon for sandwiches in place of deli meats, which are often higher in sodium. Shop smart: Eating more seafood does not have to be expensive. Whiting, tilapia, sardines, canned tuna and some frozen seafood are usually lower cost options. Check the local newspaper, online, and at the store for sales, coupons, and specials to help save money on seafood. Grow up healthy with seafood: Omega-3 fats from seafood can help improve nervous system development in infants and children. Serve seafood to children twice a week in portions appropriate for their age and appetite. A variety of seafood lower in mercury should also be part of a healthy diet for women who are pregnant or breastfeeding. Know your seafood portions: To get 8 ounces of seafood a week, use these as guides: A drained can of tuna is about 3 to 4 ounces, a salmon steak ranges from 4 to 6 ounces and 1 small trout is about 3 ounces. The following recipe, from “Seafood Lover’s Bible,” a cookbook by Michael Bavota, is one of our favorite ways to incorporate seafood or shellfish into our diet. With recipes like this one, it’s easy to kick the red meat habit. Peel, devein and rinse shrimp. Cook pasta in boiling water, following directions on the box. Rinse pasta with cold water and set aside. In a medium saucepan, boil shrimp for only 3 minutes. Remove from heat and set aside. Cut broccoli and scallions into small bite-size pieces and boil until colors turn vivid green. Remove from heat and drain. In a large skillet, heat clam sauce and vegetables for 4 minutes at medium heat. 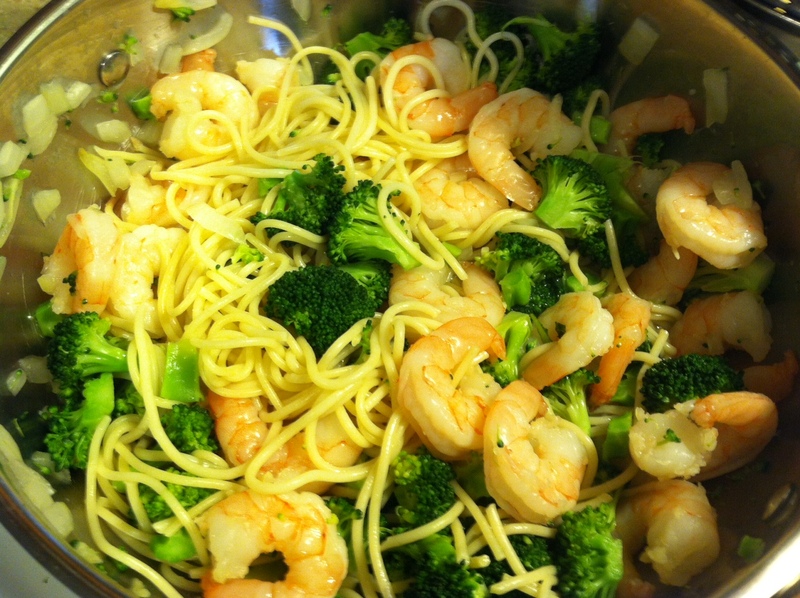 Place pasta in shallow bowls, spoon clam and vegetable mixture over pasta, and garnish with cooked shrimp. Thanks, Jeff, another winner. We love seafood. The only thing I’d add is that we never boil veggies anymore. Arnie bought a Microwave Pasta Boat [www.Telebrands.com] which cooks veggies perfectly. They steam & remain firm & crunchy – like I like it – without overcooking. Tried to add photo but it didn’t work. Will send it to you.